Start off your visit on the 23rd (Sun): contemplate the long history of SS Jeremiah O'Brien. Keep things going the next day: contemplate the long history of Alcatraz Island and then take in the waterfront at Fisherman's Wharf. To find more things to do, reviews, traveler tips, and tourist information, read our San Francisco online trip maker . Amritsar, India to San Francisco is an approximately 21-hour flight. You can also do a combination of train and flight. Due to the time zone difference, you'll gain 13 hours traveling from Amritsar to San Francisco. Traveling from Amritsar in December, you will find days in San Francisco are a bit cooler (17°C), and nights are about the same (8°C). Finish your sightseeing early on the 25th (Tue) so you can travel to Las Vegas. Kick off your visit on the 26th (Wed): take in panoramic vistas at Eiffel Tower Experience at Paris Las Vegas, get a taste of the local shopping with The Strip, and then admire the local landmark of Bellagio Fountains. For more things to do, traveler tips, reviews, and other tourist information, read our Las Vegas itinerary maker website . Traveling by flight from San Francisco to Las Vegas takes 4 hours. Alternatively, you can do a combination of subway and flight; or drive. Traveling from San Francisco in December, expect slightly colder with lows of 4°C in Las Vegas. Wrap up your sightseeing on the 26th (Wed) to allow time to travel to Grand Canyon National Park. Spend the 27th (Thu) exploring nature at Grand Canyon National Park. There's lots more to do: get great views at Pima Point, don't miss a visit to Powell Point, admire the landmark architecture of Grand Canyon Railway Depot, and get a taste of the local shopping with Lookout Studio. For traveler tips, more things to do, maps, and other tourist information, use the Grand Canyon National Park trip planner . Traveling by combination of car and flight from Las Vegas to Grand Canyon National Park takes 4.5 hours. Alternatively, you can drive; or take a shuttle. Due to the time zone difference, you'll lose 1 hour traveling from Las Vegas to Grand Canyon National Park. Expect little chillier weather when traveling from Las Vegas in December: highs in Grand Canyon National Park hover around 8°C, while lows dip to -11°C. Wrap up your sightseeing on the 29th (Sat) to allow time to travel to Key West. 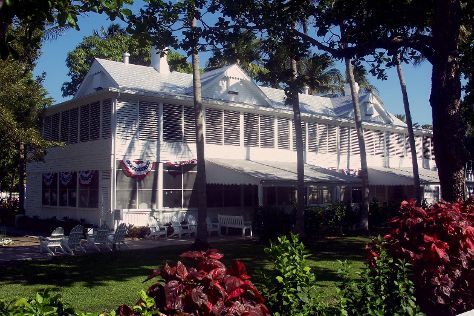 Start off your visit on the 30th (Sun): admire the natural beauty at Audubon House & Tropical Gardens, see the interesting displays at The Ernest Hemingway Home and Museum, then look for all kinds of wild species at Key West Butterfly & Nature Conservatory, and finally take in the architecture and atmosphere at Saint Mary Star of the Sea. Here are some ideas for day two: steep yourself in history at Curry Mansion, then steep yourself in history at Truman Little White House, then admire the majestic nature at Fort Zachary Taylor, and finally explore the different monuments and memorials at Key West Cemetery. To find photos, ratings, where to stay, and tourist information, you can read our Key West online trip builder . Traveling by combination of bus and flight from Grand Canyon National Park to Key West takes 13.5 hours. Alternatively, you can do a combination of shuttle and flight; or do a combination of bus, shuttle, and flight. Traveling from Grand Canyon National Park to Key West, you'll lose 2 hours due to the time zone difference. In December, Key West is warmer than Grand Canyon National Park - with highs of 30°C and lows of 25°C. Finish up your sightseeing early on the 31st (Mon) so you can travel to New York City. Kick off your visit on the 1st (Tue): take in the pleasant sights at Central Park. On the 2nd (Wed), you'll have a packed day of sightseeing: take a stroll through Times Square, make a trip to Rockefeller Center, then pause for some serene contemplation at St. Patrick's Cathedral, and finally appreciate the history behind 9/11 Memorial. For traveler tips, ratings, other places to visit, and other tourist information, you can read our New York City vacation builder site . You can do a combination of flight and bus from Key West to New York City in 6 hours. Alternatively, you can fly; or drive. Plan for much colder temperatures traveling from Key West in January, with highs in New York City at 5°C and lows at -5°C. Finish up your sightseeing early on the 2nd (Wed) so you can travel back home.